The FuelBelt Ergo Hydration Running Belt was provided for review. The FuelBelt Ergo Hydration Running Belt is a lightweight belt designed to carry two eight-ounce water bottles. It is specifically designed to fit a woman’s body. The water bottles, which come with the belt, are BPA-free, so you don’t have to worry about Bisphenol A (a carcinogen) leaching into your water from the plastic. There is a storage pouch for smart phones, which is completely detachable. Inside the pouch, there is a hole for a wire to be inserted, in case you are using wired ear buds. The pouch is held in place by Velcro and a zipper. Two detachable micro race locks are also included. 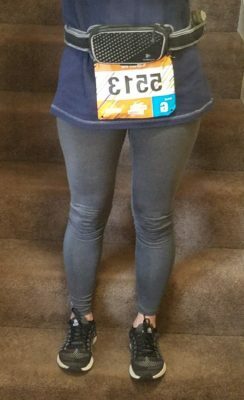 These are used to hold a race bib in place without pins, saving expensive tech shirts from holes and snags (as shown below). The belt contains reflective accents for visibility when running in low-light conditions. Hex foam moisture wicking padding surrounds the inside of the entire belt. Total weight of the FuelBelt Ergo Hydration Running Belt, including the (empty) bottles is 350 grams. The FuelBelt Ergo Hydration Running Belt can hold up to 16 ounces of fluid. This is, in most weather, enough for a medium-long run for me. 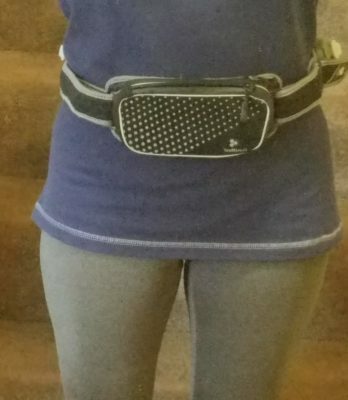 I would use this hydration belt for runs of 10 – 16 miles. For runs shorter than that, I would use a hand held system and carry less water. For longer runs, I would need a larger amount of liquid. I inserted my Samsung Galaxy S7 phone easily into the storage pouch. This is a convenient way to carry your phone to use for fitness apps, music, or just to keep in touch or snap pictures of your run. It is easy to put the FuelBelt Ergo Hydration Running Belt on and take it off. It is very comfortable and light. The system that I now use contains four eight-ounce water bottles and tends to get heavy and uncomfortable. This system seems much more ergonomically designed. It only has space for half of the liquids that I am currently using, but this will be sufficient for all but my longest runs. The straps that go around your waist are big enough to fit almost any sized runner. I usually wear a size (S), and the strap was long enough that it may interfere with accessing the water bottle. I will have to see how it works on an actual run. The phone pouch of the FuelBelt Ergo Hydration Running Belt is worn in the front, so it will be easy to access my phone during a run. The water bottles, however, are worn in the back. I had slight difficulty removing and inserting the water bottles from their holsters. This may improve at this with a little practice. I tested the detachable micro race locks and found them easy to use. The test bib fits perfectly, and the locks held the bib securely in place. I am excited to test the FuelBelt Ergo Hydration Running Belt during my next 10 – 16-mile run. Check back in a few weeks. I will let you know how it works! 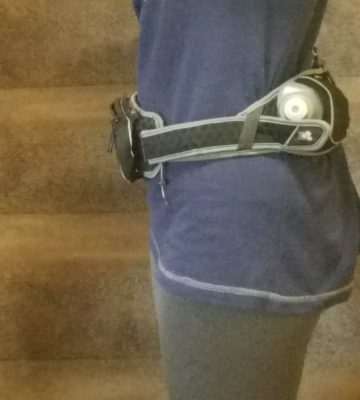 I used the FuelBelt Ergo Hydration Running Belt for a recent half marathon I ran on a rail trail. Race day was hot and humid, so hydration was a necessity. 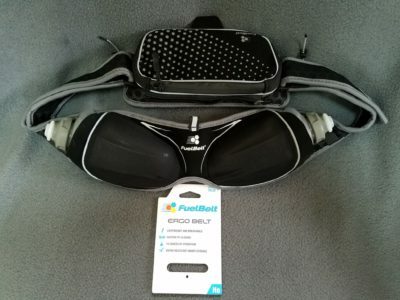 I liked the FuelBelt Ergo Hydration Running Belt very much and would like to test it on a slightly longer run. Check back in a few weeks for my final update.